Exercises for senior citizens: As people age the risk of injury associated with falls increases tremendously. Much of this risk can be attributable to an associated decrease in strength, flexibility, and balance. I see it everyday living in a retirement community, people walking hunched over a walker, with or without a cane, cautiously moving always with fear of falling. You don't have to fear anymore! Take action today to help yourself and to live with strength and confidence! The goal of a program of exercises for senior citizens should focus on preventing falls from even occurring. I have outlined the most effective exercises for senior citizens, and a good program should focus on three vital components. Keeping both of these goals in mind while developing exercises for senior citizens let's first look at muscular strength. An increase in muscular strength should be the primary focus. As strength is increased, individuals will feel more stable on their feet and more confident in their movements. Furthermore, improvements in muscular strength will improve skeletal stability and thus, reduce the risk of resulting fractures, sprains, and dislocations. Check out this page for more information about exercising and the older adult. An individual's feeling of stability will also be enhanced due to postural improvements associated with strength gains. A consistent and ongoing strength training program performed 2-3 times per week for about 30 minutes can produce significant gains in strength and confidence of senior citizens. Strength training can involve a variety of methods including weight machines, dumbbells, elastic bands, balls, body weight, and Pilates spring based equipment. The exercises should focus on strengthening the legs, feet and ankles, and upper body for better posture. One facet of fitness that is often overlooked is flexibility. Similar to improvements in strength, improvements in flexibility incorporated into older adult exercises are not only going to aid in preventing falls, but will also help reduce the risk of injury when falls do occur. Increases in flexibility will aid in the ease with which you move and perform daily activities. If a fall were to occur, muscles that are stretched regularly will be much more amenable to trauma than would muscles that are not stretched regularly. Pilates based exercises incorporate both strength and flexibility into the program all at the same time. The goal is to stretch your muscles or work them in their full range of motion while strengthening them with spring tension at the same time. This makes your muscles not only stretched out, where they can become weaker from overstretching, but also strengthens them in this elongated state. 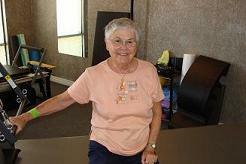 Balance is the final key factor in fall prevention exercises for senior citizens. The aging process results in a natural degradation of motor control and sensory capabilities. Specific balance exercises designed to enhance these capabilities can be very effective. 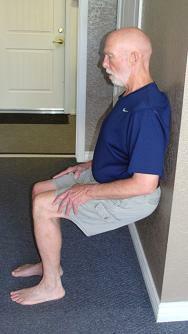 Posture is often overlooked as one of these keys to fall prevention. If you are stooped over and always looking down at your feet this will throw off your center of gravity and, in turn, may cause you to lose your balance. Because good posture is dependent on abdominal strength to stand up straight and tall Pilates is an ideal exercise for senior citizens to help improve their posture and balance. I have been teaching and helping senior citizens improve their balance and posture through physical exercise for over 12 years and believe that the exercises in this ebook can help you too! With the new revised Pilates ebook I have added specific standing Pilates balance exercises. Get it here today! Leave Exercises for Senior Citizens and get your Pilates ebook today with loads of great core strengthening and stretching exercises!